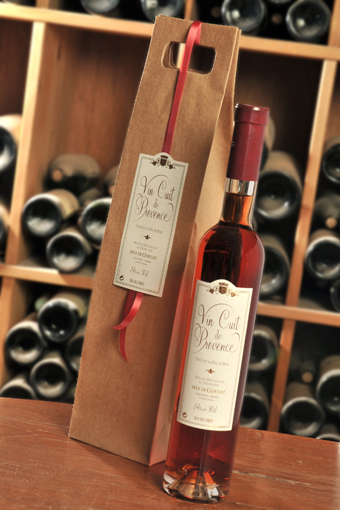 A legendary dessert wine served in Provence for Christmas. This slow cooked wine reveals unusual toffee and smoky aromas with a perfect balance. The “Vin Cuit”, cooked wine, is a tradition from Aix-en-Provence. The production of this long forgotten wine almost came to an end. Only a few old families of winemakers kept making this mythical wine. The Vin Cuit is served for Christmas in Provence. It is drunk during the ceremony of “cacho-fio” and with the famous 13 desserts of Provence like the “gibassier”, nougat, dried fruits, calissons… à Aix en Provence, le vin cuit fait partie de la tradition provençale. Ce vin mythique a été oublié et sa production a presque disparu. Seuls quelques vieilles familles vigneronnes ont su conserver ce vin légendaire. The must is cooked in a cauldron over a wood fire. Once the must has reduced, the fermentation will take place in a vat. It is then aged for a few years in old oak barrels. A deep amber colour with its aromatic nose and a rich bouquet of toffee, citrus, prunes, dried apricots, dry nuts… The mouth is full and round. The sweetness comes first, alcohol and vibrancy follow to give length and density. On the finish aromas of prunes and dried fruits again with its specific smoky notes due to the wood fire. Chocolate, pastries, sweets are the pairing of choice.